In 1961, Alan Perlis, an early pioneer in computer science, advocated that computer programming should be a requirement of a liberal arts education. He believed students of creative disciplines should learn programming, not so they could become programmers, but so they could learn more about how to construct and analyze processes — whether building an imaginary world for a video game, designing a brand logo, or telling a compelling story. Fast forward to the present, where computation and creativity have become intertwined in the design process and Perlis’ advice becomes not just wise, but prophetic. Computational design — which uses technology to design multiple experiences across multiple channels for multiple audiences — is now necessary to deliver products and services in a digital era. Yet, many design-led organizations are still resistant to mixing logical processes with creative ones, fearing that technology can stifle rather than heighten creativity. It’s time for a mindset shift. With the use of artificial intelligence (AI) and machine learning technologies, computation is radically changing how we design — from automating repetitive tasks to generating thousands of options instantaneously. And, its value isn’t just in making design faster, it’s also in creating better, more human-centric designs. 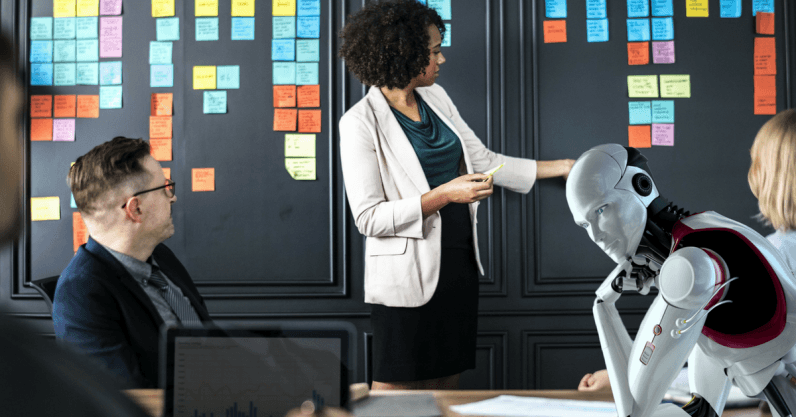 In Adobe’s recent Creativity in Business survey, 69 percent of creatives see their use of AI increasing over the next five years. Many are using computational design to automate processes, from generating templates and retouching photos to naming files. The question for design-led organizations then, isn’t if computational design principles should be embraced, but how. As leaders, we must inspire our teams to see computational design as elevating creativity and the principles of design thinking, not hindering it. Here’s the case I make to my teams. Design principles and computing principles have more in common than we often recognize. In both disciplines the focus is on communicating information, solving problems by approaching them from multiple angles, and overcoming limitations through creativity, efficiency, and innovation. Computational design erases the boundaries of what is possible and opens up greater creative opportunities by enhancing the efficiency of the design process. With the right technologies in place that allow designers to build flexible templates, easily find and access creative assets for reuse, and apply machine learning to automate the process, even a small creative team can generate a variety of designs for every channel — social, web, advertising, and others — quickly. This simply wouldn’t be possible without the help of computation. Designers can also create more human-centric designs through the aid of computation and automation. In the past, personalization of designs was time-consuming and expensive. However, with the assistance of computing power, your creative teams can now create and deliver creative content that can dynamically change in real-time to capture the mindset of multiple audiences viewing the same web page, ad, or landing page. It’s design on steroids — designing one-to-million experiences instead of one to few. The Creativity in Business survey also found that 60 percent of creatives said they are spending more time today creating content. Another 38 percent said that iterating on designs and getting approvals is consuming more time today than three to five years ago. Computational design alleviates these pressures through automation. By taking tasks off of designers’ plates that are more iterative than creative, computational design actually opens the door to greater creativity. With additional time on their hands, your creative team can apply their imagination to solving more complex and strategic design challenges. Computational design principles, when applied correctly, can also help seed innovation. Because computers can sift through large quantities of information to find all possible design solutions — something humans simply aren’t capable of (at least not quickly) — it enhances the ideation and experimentation process of design thinking. For example, when your team is designing new product packaging, the use of computational design lets them quickly iterate not just dozens, but hundreds of design options. Having a greater variety of choices not only unleashes your team’s imagination in new ways, it opens the door to new creative possibilities. Trying to manually design dozens of options would take days or even weeks to create and test, but it takes only seconds or minutes when applying computational power to the effort. Additionally, computation allows your team to change background color schemes, automatically or rapidly alter an image into different artistic styles, such as mosaic, impressionist, or realist. Then, your team can also test these different designs and receive real-time feedback to learn faster what your audience prefers. Ultimately, computational design isn’t about making designers into computer science geeks. It’s about creating great designers — who can pull from both their computational and their classical design knowledge to address creative challenges in a digital era. This is why, as a creative leader, you must look beyond classically trained graphic artists, architects, or industrial designers to those who have an understanding of computational design. The future of design will inevitably be coupled with technology. By marrying computational principles with design thinking, you can empower your team to bring human intuition and computational thinking together for greater agility and innovation. Empathy for the audience stays at the heart of the design process, but computational design opens up new avenues for thinking about how to achieve and deliver a design-driven experience. That’s where the future of design is headed, and that’s where your organization needs to be.